There’s a world of incredible riding beyond the United Kingdom’s mainland that many keen bikers are yet to discover. For example, you can experience all that Spain’s Ronda road has to offer as well as France’s Verdon Gorge (which is also known as Europe’s Grand Canyon). There’s also Italy’s Stelvio Pass which is another delight for many motorcyclists on holidays. 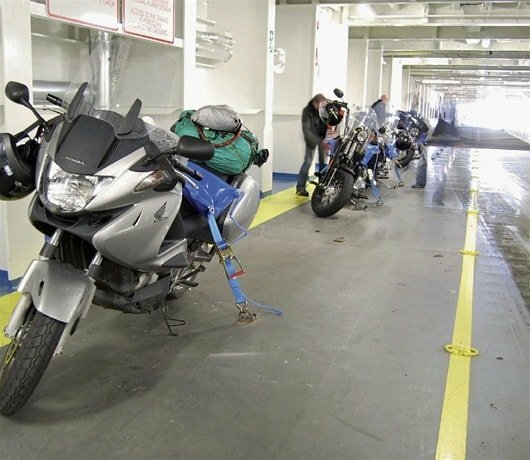 However, if you have never travelled with your motorbike on a ferry before, you probably have lots of questions on the possibility of travelling with your bike as well as the processes involved. We have put together this guide to provide answers to your questions so you can have all the fun you deserve on your holiday. Confirm you have your passport or ID card with you as all passengers will be identified at the port. Check your motorbike is in good running order, and that it meets the requirements of the country you’re travelling to. Book your motorbike as early as possible to ensure there is available space. Pack the basic things you will need like spares, riding gear, tent etc, and don’t forget your first aid kit. Purchase an International Driving Permit from the Post Office or the AA if you plan travelling outside the UK. You can read up your entitlements on the Permit in any of the languages. Plan your journey to the port so you can meet up with the minimum check-in time before departure. As expected, the first thing to so when you arrive at the port is to check-in with your motorbike at the ferry terminal, so get your booking reference and passport ready to avoid unnecessary delays. After confirming your documents, your passport will be returned to you with your boarding card. The port staff will direct you through the security checks after which you will be directed onto the ship. Watch out for slippery surfaces as you board the ferry. The loading process can take a little longer than expected as it is a skilled operation requiring careful positioning. Vehicles are loaded on the basis of type and size to ensure that all can fit which means some vehicles may move ahead of you. Therefore, be patient with the process as it’s not necessarily first-come-first-served. When it’s your turn, you will be directed to where to secure your bike. Some operators will help you secure your machine while some will leave you to do it. The crew will check to confirm that all vehicles are secure before the ship departs. Make sure you take whatever you need before you leave as you can’t get back to your bike once sailing begins. If possible, have a list of the essentials you will need so you can carry them with you. Brittany Ferries takes motorbikes as all its routes to France and Spain, with up to two passengers (including the driver) allowed per motorbike. Bikes are stored on the car deck and the crew are trained to help safely secure them. The ship’s Loading Officer will guide you onboard, please pay close attention to their instructions. Once onboard, your bike will be secured using heavy duty ratchet straps. Thick foam pads are placed across your bike to ensure they are not scratched by the straps. Chocks are used to ensure your bike remains in place throughout the crossing. This picture from Brittany Ferries shows motorbikes being secured using ratchet straps and padding. Caledonian accepts bikes on all its routes to the Channel Islands and France, with up to two passengers (including driver) allowed per vehicle. Motorbikes can only be positioned and secured only under CallMac staff supervision. Caledonian strongly advise you call them for more information. Telephone: 0800 066 5000 from the UK and +44 (0)1475 650 397 for International. Monday to Friday: 07:00 a.m. – 07:00 p.m.
Saturday and Sunday: 08:00 a.m. – 05:00 p.m.
Monday to Friday: 07:00 a.m. – 09:00 p.m.
Saturday and Sunday 08:00 a.m. – 08:00 p.m.
Condor welcomes motorbikes on all its routes to the Channel Islands and France, with up to two passengers (including the driver) allowed per motorbike. Bikes are stored on the car deck and the crew are trained to help safely secure them. To find out more, click here. Condor state that you should check-in no later than 60 minutes before your departure time. Follow the signs to the Condor Ferries Car Check-in and they will issue you with a sticker for your bike screen. Like Brittany, Condor uses protective padding to ensure your bike is kept safe whilst securing straps keep everything in check. DFDS accepts bikes on all its routes to with up to two passengers (including driver) allowed per vehicle. Motorbikes are stored on the car deck and the crew are trained to help safely secure them. To find out more, click here. Irish Ferries takes motorbikes on all its routes, with up to two passengers (including driver) per vehicle. The operator provides securing equipment to bikers on all its cruise vessels except on the HSC Dublin Swift as members of the deck crew will secure the bikes onboard because of the speed of the ship. To find out more, click here. P&O Ferries welcomes bikes on all its routes to Calais, Dublin, Larne Rotterdam, and Zeebrugge, with up to two passengers (including driver) allowed per motorbike. Motorbikes are stored on the vehicle deck and the crew are trained to help safely secure them. To find out more, click here. To find out more, click here. Red Funnel takes motorbikes on its vehicle ferry service from Southampton to East Cowes, with up to two passengers (including driver) allowed per vehicle. Motorbikes are stored on the vehicle deck and the crew are trained to help safely secure them. The red Jet route between Southampton and West Crowes is for foot passengers only. To find out more, click here. Stena Line accepts motorbikes on all its routes to Ireland and Holland, with up to two passengers (including driver) allowed per vehicle. Bikes are stored on the car deck and the crew are trained to help safely secure them. To find out more, click here. Wightlink welcomes motorbikes between Portsmouth and Fishbourne, and Lymington and Yarmouth, with up to two passengers (including driver) allowed per vehicle. Note that the route between Portsmouth and Ryde is for foot passengers only. To find out more, click here. The Isle of Man Steam Packet Company takes motorbike bookings as standard on all its routes to the Isle of Man, with up to two passengers (including driver) allowed per vehicle. This crossing service is incredibly busy during racing, so book at least a year in advance to ensure you get onboard. The same goes for accommodation. To find out more, click here. To see their latest offers, click here. If in doubt if a ferry company can accommodate your motorbike and for more information on how they do so, it is best to call the operator directly. Smaller ferry companies, especially those ferry companies that operate inter-island routes may not be as easily able to take your motorbike so best to check ahead of time.